I'm posting from my i-phone so I'll keep it short. Reagan was still asleep when we left the house at 10am. Sleeping is great but that was a bit of a red flag. She woke crying about 5min before we got to the hospital. She's slept nearly all day (which isn't great for catching twitches she only does when she's awake)! When she's awake, she's crying. Inconsolable crying that only stops when she falls back asleep. She's only opened her eyes a handful of times all day. She's miserable and it has nothing to do with the EEG...since it started before we even got here. Talk about bad timing. I just hope we can get a few more "events" recorded before tomorrow (I've only noticed one head twitch so far). Hoping they'll have enough data to rule out seizures...and hypsarrhthmia. Please keep our miserable little one in your prayers! Today has been another busy day. Reagan woke bright and early at 4am. We never did get her to go back to sleep. Mike tried, I tried. No luck. She was very gurgly...I kept trying to re adjust her but she just kept gurgling. I couldn't go back to sleep. We got up and started medicine early...Reagan had a 9:30am appt with the geneticist that specializes in mitochondrial disorders. 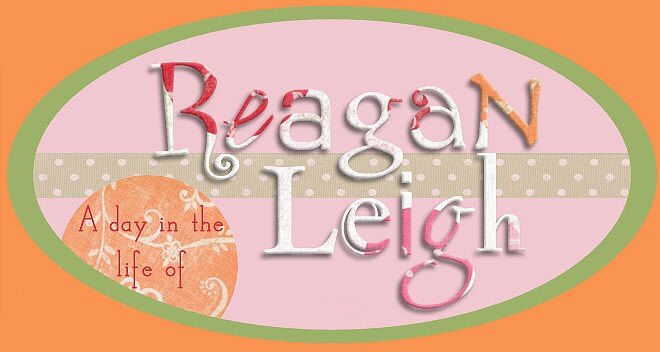 I had already been told that he rarely ever diagnosed kids with mitochondrial disease and I was actually expecting him to tell me that in his opinion Reagan did not fit the criteria. That was not exactly the case. He did say that until a genetic mutation is identified, nothing can be 100% certain (yes, tell me something I don't know). But he did agree that Reagan fit the bill and that her muscle biopsy did show mitochondrial dysfunction. He was very knowledgeable and spoke about the science of it all...although now that I think about it, I'm not sure if he even knew I had a medical background. He basically said that we're already doing everything we can do. He thinks we're surrounded by some good doctors that are going to do their best to help us. He is running a study in which they do gene sequencing of all of the genes that have been identified in mitochondrial dysfunction. He said if we're interested (yes) we can sign a consent for and he "might" include Reagan in the study. There are other patients he wants to run first, but we "may" end up in the mix. He also ordered some blood and urine tests of a couple disorders that he thinks Reagan may have never been tested for. So we'll see. From there we went to the lab for blood and urine. It was a quick blood draw, no problems whatsoever. I seriously didn't think we were going to get her to pee, but our nurse pushed on her tummy in just the right spot and we ended up with just enough to run the tests (the rest leaked out into her diaper). Did I mention what a wonderful mood Reagan has been in today? Just smiling and sweet as she can be. We had an hour to waste til feeding therapy so we took a short shopping detour. Then off to feeding therapy where she did GREAT. She started off a little gurgly so her therapist gave her some saline up the nose and got her to cough up a big lougy. After that she sounded better and ate some applesauce, drank some juice, and chewed on a skittle! I was really surprised that she chewed that hard skittle (it was wrapped in some fabric). Then we came home and she had physical therapy! It's been a busy day...especially for a girl going on less than 4hrs of sleep. And to top it all off...Grandma came to visit! It's been 3 weeks since we've seen Grandma. She had borderline pneumonia and it took her 3 weeks to get over it. Reagan was very happy to see her. She'll be a big help tomorrow with the EEG. Please continue to keep Reagan in your prayers as she gets this 23hr EEG tomorrow. We have to be there by 10:30am and they'll hook her up around 11am. I'm still seeing the head twitches (and other questionable things). Hopefully we'll get a good representation on the EEG...prayers that it rules out seizures. Reagan has had a sleepy day today. Not sure why...she slept fairly well last night. Although she did wake crying and I found her laying completely uncovered in her bed. She cuddled up in our bed to warm up. Never a shortage of cuddles for this girl. No therapies today. Just a quick follow-up appt with her PM&R doc (that's physical medicine and rehabilitation). She checked out Reagan's new AFOs and I asked her for a prescription for some knee immobilizers, so we can work on standing without having to always put her in the stander. She was happy to see Reagan "still". The last time we were in Reagan's chorea was out of control and she was moving nonstop. I told her my hypothesis that the chorea is related to the strep infections she kept getting in January. It always seems flare up when she's not feeling well and it is nearly absent when she's healthy. Who knows. Always guessing with this girl. Today I did manage to get her 23hr EEG moved up to Friday. I called and they had a cancellation, so Friday it is. The sooner the better. She's still having the head twitches. I say twitches because I hope that's what they are, but in all honesty they do feel like spasms. I just hate that word. Praying that's not it. Would you pray with me? No more spasms...infantile or otherwise...period! Today I spoke with her regular epileptologist and he thinks maybe we should increase her Banzel and if we don't see improvement order an EEG (he doesn't know that we already have that lined up). Then I spoke with the new epileptologist's nurse (the one that ordered the 23hr EEG) and she said not to increase anything yet. Too bad. I already did it this morning. I guess that's the problem of dealing with two separate doctors. So far no changes other than the fact that she took a 6+hr nap this afternoon. Hopefully we can get her to sleep tonight. She's got an early appt tomorrow morning with the geneticist. Should be an interesting appt. I need my sleep. Please continue to keep Reagan in your prayers...that maybe this increase in Banzel will get rid of any potential seizures. No seizures...that's my prayer. Reagan continues to amaze me with her sweetness. She slept through til 5:45am, not as late as I'd hope but she woke happy and didn't mind just laying in our bed with us. I don't know if it was the early start or what but Reagan has been very laid back and mellow all day today. At 10am the teacher, OT, and speech therapist all showed up to overwhelm her. She sat in her chair with her eyes closed most of the time. That will show them! It wasn't until they were leaving that she finally perked up a little. Then it was vision therapy and then PT. It was a busy day. I finally heard back from the EEG scheduler today and the first opening they have is next Tuesday. Not exactly what I was hoping for. In the meantime, I'm going to try calling her each morning to see if she has any cancellations. I just want to get her in and get this over with. Next week we already have an MRI scheduled, so having both the 23hr EEG and MRI back to back will be a little much. We'll see. Reagan has been super sweet again today. Super cuddly...my favorite. Still a little twitchy. Just in the last week or so I've really noticed how she's filled back out. She looks healthy again. I can see it in the cheeks, arms, and thighs...no more skin and bones. We may actually have to keep an eye on her intake...we can't have her gaining too much weight...Mommy still has to carry her! Please continue to keep my precious girl in your prayers. Reagan slept well again last night not waking til 10am this morning! And with big eyes and smiles to boot! We had to rush a little to leave in time for therapy but we made it. Reagan did really well. She was very alert and had good head control during OT. Then during feeding therapy she ate some applesauce and a piece of graham cracker! I was surprised about that one. She was actually chewing it! Then we came home and took it easy for a while. I thought she was going to take a nap but that didn't happen. Thankfully the good mood held out all day. Still no call from the EEG scheduler. Turns out she left early Friday and was out all day today. Hopefully she'll get her act together tomorrow and fit us in! I've seen a couple more head twitches today. I also noticed some tiny little twitches in her hands and feet. You can't see them but when she's completely still and you're holding her, you can feel them. Again, hopefully none of these are seizure related, just annoying twitches. Please keep all of this in your prayers. Reagan finally slept through the night in her own bed last night!!! Yay!!! She was a little restless when I first laid her down and I was worried she wouldn't last, thankfully she did. She woke up early around 6:30am and I put her in our bed where she giggled and smiled and kicked...not wanting to go back to sleep at all. She's been in a great mood today. This morning especially, she was so smiley and cuddly, so precious! This afternoon she had a few little meltdowns but mainly when she got tired. She took two good naps today...quite unusual for her. We haven't seen any more of the startle episodes, thank God. I have seen a few head twitches though, a couple yesterday and some today as well. Hopefully it's nothing but a twitch. Please continue to keep her in your prayers. I'm not sure when they'll get her in for the 23hr EEG this week. I'm hoping sooner rather than later. She's got doctors appts Wed and Thurs and I really don't want to have to reschedule them. Last night was not much of a night for sleeping. Reagan woke up from her 8hr nap at 10:30pm and was not looking the least bit tired. But she was grumpy. Sometime around 12:30am the grumpiness peaked and she was just impossible to please. Needless to say, my patience was not at it's best at that time of the morning. She kept yawning like crazy but would not go to sleep. Finally sometime after 2am I was done and I put her in bed next to Mike where she eventually fell asleep. I don't know why I didn't try that sooner. This morning we had nurse number 5 come and I LOVE her. I'm so excited that we finally found someone who is a good fit. Unfortunately we'll only have her 3 times a week and another nurse (that I'm not that crazy about) for the other two days. I'm going to give the other nurse a try but if she doesn't grow on me, I plan on telling the agency to keep looking! For now I'm just happy to have one nurse I really like. Reagan has been a little sleepy today...taking two naps. I guess she's still trying to catch up on all the missed sleep from the last couple days. Overall her mood has been good, I guess she didn't want to scare away the new nurse. Tonight she's been a little cranky though. We have a few hypotheses as to what brought on the tears and big sad lip. For one, she's still yawning a lot. Maybe she's just tired. Two, I had noticed that her gj-tube was turned upside down and wasn't sure which way to turn to right it, although I "think" I turned it the right direction (gj-tubes are a little different from g-tubes...you can't let them rotate because it will wind up the tubing that goes into the intestine). I sure hope it's not the tube because that could land us in the ER. Three, she had a big poopy diaper and some gas, which never makes her a happy camper. Of course these are all just guesses. We're actually pretty clueless. Hopefully she'll get a good night's sleep tonight and sleep it off. Please continue to keep her in your prayers...we've got an EEG coming up and we are PRAYING for no seizure activity!!! Reagan eventually settled down last night...only moments before I was going to give her Diastat. She fell asleep and finally her little body could rest. She slept well, waking at 5am crying but fell asleep the second I picked her up. I put her in bed with us where she slept past 9am. Today she's been more relaxed. I didn't see any more of the arm movements today...thank God! It was a nerve wracking day, watching her like a hawk. I spoke with the nurse around noon and she agreed that it was time to just get her in for the 24hr EEG. I was hoping to get it done this weekend but it seems the hospital didn't get through processing everything today so we probably won't hear from anyone from scheduling til Monday. Why does everything have to happen right before a weekend? Needless to say I'm not looking forward to the next couple days. Most of the day was pretty normal for Reagan, but this afternoon she got a little fussy and then fell asleep at 2:30pm watching a movie. 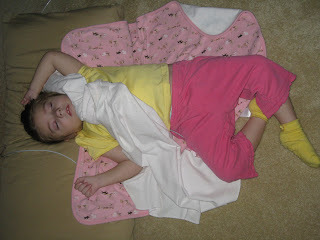 Reagan is not a napper, so this was unusual. Then she slept...and slept. Hours passed by...every now and then she would cry out and stretch but she stayed asleep. And now here it is 10:30pm and she wakes up (with a poop no less)! I was really hoping she'd just keep sleeping and sleep through the night. Oh well. It might be a long one tonight. What's strange is that there seems to be a pattern here. Every so often she'll have the crazy chorea movements and not be able to sleep for a day or two and then she'll do a 180 and sleep for an entire day. Not sure what that's all about. Maybe she needs a sleep study too?!?! What are we going to do with this girl. Please keep her in your prayers! Reagan could not fall asleep last night. She just laid in bed doing the nonstop movements. I kept waking up and looking at the monitor, only to see her moving, moving, moving. Finally around 4am I put her in bed with us where Mike cuddled her and she finally settled down. But every 3 min or so she'd wake up suddenly, breathing hard and moving around like crazy. Then she'd settle down and go back to sleep. This happened for at least 30+min til she was out for good. She slept til 10:15am and seemed to be in a good mood when she woke. And although happy, the whole day she's continued to be tense. Lots of moving, kicking, etc... Then we gave her a bath this afternoon and as I picked her up from the water, she threw her arms out, taking a deep breath in. Like a "startle". I didn't like the look of that. Then I saw her do it again an hour or so later as she played with her toys. Then around 5pm or so I saw her do it again. And again. And again. By the time we left for Bible study she was doing it every couple minutes or so. On our way back from Bible study she was doing it every 20 seconds or so. She was doing it so often I had the diastat out and ready to go. It looks very similar to what she was doing in the hospital when we blew on her. She'd inhale and throw her arms out. The EEG showed it was nothing, but that was always in response to something. This is not. And unfortunately, it's also very much what an infantile spasm looks like. I pray it's not. Pray, pray, pray. I knew it was unlikely for Reagan to remain seizure free for the rest of her life, but at the same time I thought I could handle it, as long as we were free of infantile spasms. I can't take it. I can't take infantile spasms again. I really can't stand watching my child have nonstop seizures, all day long, every day...AGAIN. I just can't take it. So pray that that's not it. That it passes and that it's not seizure related but maybe something along the lines of chorea. I've already left a message for the epileptologist's nurse and hopefully we can get her in for that 23hr EEG ASAP. Lots of prayers needed. This girl. She's been up since 3:45am. And when I say up...I mean wide awake and kicking! I got up with her thinking surely she'll get tired and go back to sleep. No way, at 6am she was still going strong. Then I tried her out in our bed and she just laid there moving about not sleeping a wink. Finally around 7:45am I gave up trying to sleep and we were up for the day. Lots of movement today. The chorea has really picked back up and she's so tense. The sweaty hands and cold sweaty feet are back too. She's also been running a low grade temp most of the day. Who knows what this is all about! I really thought she was on the road to recovery, now I don't know what to think! Her mood has been great though. Lots of smiles and laughs. We went to feeding therapy today and she did really well, except for the fact that the therapist had a hard time holding her because of all the extension. She ate some applesauce, not too crazy about the veggie sticks today. But no throwing up today so that was great. Yesterday afternoon I left messages for the nurses of the two different epileptologists Reagan sees. Of course the new epileptologist's nurse was the first to call us back. She said that the eye movements do sound like seizures. But since they are so infrequent she said just to watch her and if she does it again and they'll order a 23hr EEG. Then finally this afternoon I heard back from her main epileptologist's nurse and he's thinking maybe it's just chorea related and not actual seizures. I sure hope so. Both suggest just to wait and see what happens. Hopefully nothing. Please continue to keep her in your prayers...if we could get her seizure free AND healthy we would be in absolute heaven! Reagan slept a little better last night. Of course, most of the time it was in our bed, but we'll take any improvement over the night before! She still woke, but not as often. I'm hoping soon she'll get back to sleeping through the night in her own bed...we could all use the rest. She was still nauseous today but definitely less than yesterday. She had two big throw ups, one first thing in the morning and one tonight when I tried to brush her teeth. She coughed and gagged at times throughout the day but she managed to keep it down. We went ahead and resumed normal activities today. 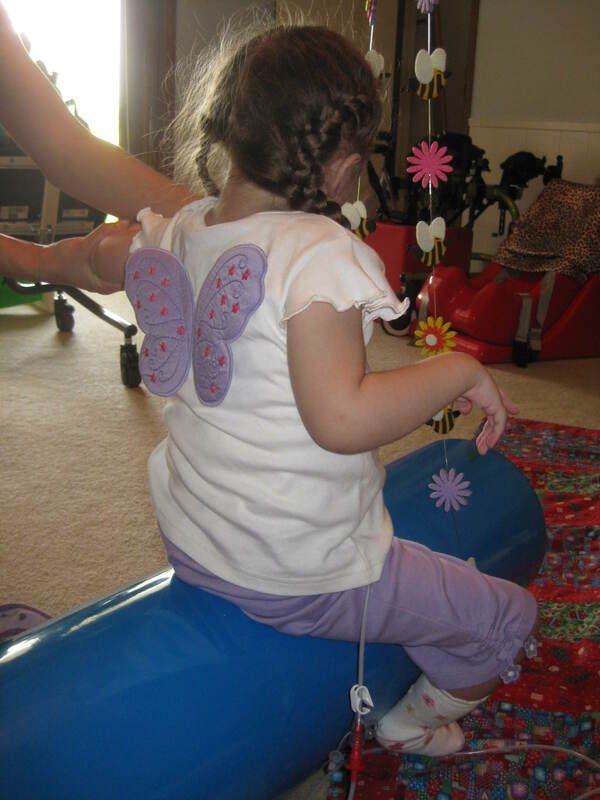 She had school (1hr of homebound "teaching"), vision therapy, and physical therapy all from home. She tolerated it really well. Her PT mentioned how impressed she was today with her head control. Too bad when we put her in her stander she was already tired out and not holding her head very well. She actually only made it about 20min in the stander...we had to take her out when gravity worked it's magic leading to the second dirty diaper in under an hour. 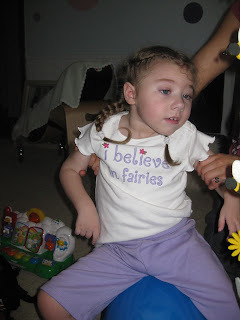 Then this afternoon I was talking with her nurse about what Reagan's seizures used to look like (because she was recording medicines, one of which is Diastat, the rescue seizure med). I showed her the video from September (the day she started Banzel). It's still disturbing for me to watch. But oh what a blessing for those seizures to be gone only a few short months later...after 2+ years without any relief whatsoever. Meanwhile, Reagan was laying on the floor with her toy and something made me go check her out. She was doing the weird eye thing again. We've only seen her do it once before and it was about a week and a half ago. Her eyes widen and then go back to normal, widen and then back to normal. Over and over again. From the time I noticed it to the time it stopped was about a minute. During that time she was sort of looking down. I kept trying to snap her out of it, but she was in the zone. Definitely looks seizureish. I'm hoping maybe it's just another neurological quirk, like the chorea, that looks seizureish but really isn't. That's my hope (that and to never see it again). Please say some prayers for her!! Exhausted. We all are. Reagan was up all night last night. We transferred her to our bed sometime around 1am and she then proceeded to wake up every 15min or so and we'd have to shush her back to sleep. Not a good night. On a positive note, she woke up semi-happy today. No more crying...so that's definitely a good thing. On the other hand, she's spent the entire day extremely nauseous and throwing up frequently. Lots of volume to these throw ups. I don't know if the nystatin we're giving her for her possible yeast infection is causing her tummy to go to town? I mean, it has been a while since she's had something in her stomach (although I don't know if 2ml 3x a day really qualifies as "something"). Poor girl. Please keep her in your prayers. We took her in to see the pediatrician on call for her doctor (who's out for 4 weeks for surgery) and she said "it looks like the virus of the week". Thanks. Glad we brought her in. We did run over to the lab for yet another genetic/mitochondrial test. So far everything has come back negative (the complete sequencing of her mitochondrial genome, the mitochip assay, and the complex I deficiency panel). Which means that although Reagan's muscle biopsy was positive for mitochondrial disorder, they still haven't identified WHY. Now they are screening her for mutations common to complex IV deficiency. We'll see if anything turns up. Last night didn't go too smoothly. Reagan was up a lot fussing/crying. It made for a very weary morning with my patience running super thin. She's still doing a lot of crying and moaning and groaning but today we did finally get some laughs, a nice change of pace. Problem is, when she's crying, she's really crying and there's just nothing you can do to make her happy...falling asleep is your best bet. She did OK today with the three doses of oral nystatin. She did throw up quite a lot of fluid tonight but it was all clear and foamy. I'm still not sure what's wrong with her. Is it really a yeast infection? I know it makes sense and there are some vague symptoms, but nothing points 100% to that (although it seems like nothing's ever clear with her and we're always guessing). My poor girl. I just want her better and some sort of normalcy to resume in our lives. Her being sick more often than not and the lack of sleep is really taking it's toll on all of us. Please continue to keep her in your prayers. It's been one heck of a day today. Reagan slept well last night but woke crying and never stopped. Seriously. She's been screaming crying literally the entire day. Every waking moment. She's completely and totally miserable. Writhing in pain. It's horrible. I've given her tylenol & motrin but nothing seems to help except sleep. She's been on nonstop antibiotics for months now. She just finished up a round of Suprax and we restarted her preventative Amoxicillin today. How could she possibly be getting sick agan?!?!? Then today I noticed some redness, not on her bottom but in the front. Just a little, but this is a child that never has rashes ever. It made me wonder if maybe what we're experiencing is the wrath of a yeast infection (from long term antibiotic use). Then I looked in her mouth and her tongue was white. Not like white with sores but white like she's been drinking milk. But Reagan doesn't drink milk...or anything by mouth. So I called the pedi on call and he agreed that it might be yeast related and called in some nystatin. It's an oral suspension and the first medication we've tried to give Reagan by mouth in months. She didn't seem to mind it. Although it's hard to tell in between screams. We also picked up some antifungal cream to try in the diaper area. Ugh...what a day. We missed Jackson's birthday party. I just hate that we couldn't go. The story of our life. It's impossible to make plans with this child...you never know what you're in for. Please say some extra prayers for her tonight. We soooooo need a better day tomorrow! Things are still off around here. Reagan woke up crying and ended up spending most of the night in our bed. This morning she was up early crying again. She had a small throw up first thing and then two big ones tonight. I'm clueless as to what is going on with her. I don't know if the nausea is just picking back up or if the hypothetical sinus drainage down her throat is making her choke and throw up. She's still super stuffy and has been wiping at her nose all day. She also had a low grade temp today, but she's had that off and on for weeks. It's just so frustrating. Why is it that Reagan continues to throw up like this even with an empty stomach? Why is it that none of the doctors seem to care? It's the same way we felt with the seizures...it was like no one even cared about stopping them but us! We really thought we were in good hands with this mitochondrial doctor, but she has been less than interested in Reagan's case. I guess it's like Mike said...for those kids that the doctors think have a chance, a shot at living a semi-normal life...they actually DO care. Unfortunately that has not been our experience at all. Other than her pediatrician, I don't know if any of her doctors really care about helping her. That's a frustrating feeling. A helpless feeling as a parent. Please keep her in your prayers...that this is only sinuses and that she's feeling better in no time! Tomorrow would be nice. So Reagan has been feeling a little off today. She woke up crying again and she's still very stuffy. The nose/eye wiping picked up even more today. She's got a big scratch on her forehead from it...we even had to put her arm restraint on her a few times to keep her from whacking herself. For most of the day her mood was OK, just off. A little feisty/cranky. We drove across town today to see a speech therapist that specializes in communication devices for children. It was only her first time to meet Reagan, so it's hard to get a good gauge on everything, but she basically just gave us some suggestions on things we can do with switches. She'd like to have some more sessions with Reagan, which I think would be helpful, but it's a loooooong drive so we'll see. This afternoon, like clockwork, Reagan had her late afternoon poop on me. This is a child who typically goes every 3-7 days and now she's going every afternoon at the same time...and on me! Maybe it's the way I hold her (I call it the poop position). Maybe it's the antibiotic. Who knows. Then tonight cranky turned into hysterical. She was very upset and she threw up a good amount of fluid (not sure where that come from). She just looked plain SICK and completely and totally miserable. She was running a low grade fever this afternoon. Ugh. I can't even stand the thought of her getting sick again. She CAN'T get sick again. Please say some serious prayers for this girl. Reagan slept well last night...but somehow I've still been exhausted. Reagan had a rough start this morning...waking up crying. Then the crying turned into coughing...she sounded sick. I was afraid we were in serious trouble. Thankfully she cheered right up and other than a super congested nose, she's been fine. She was swiping at her nose a little more today (although still not as much as last week). Her nose isn't runny or anything, I think she's got some drainage down the back of her throat and she just sounds stuffed up. No sickies please! We didn't have much to do today. No therapies. We're still sorting through nurses. The last few days we've had the same older, experienced nurse here. I like her and she's super sweet, I just don't know if she's the right fit for Reagan. Tomorrow we're supposed to try out a new nurse. And then today I met another younger nurse that I think I really like. It should be interesting to see how all of this works out. Today I had the pleasure of looking over Reagan's photos from her photoshoot with the photographer. She came over to our house and we went through each and every photo she took and decided which ones we wanted edited. We narrowed it down from 215 to 40! So many good pics of my little princess...I was smiling nonstop! I can hardly wait to see these pics in print! So exciting! Unfortunately we've got another 3 weeks or so to wait because the photographer is rushing to do senior pics right now. I know it will be worth the wait, but boy am I anxious! These pictures are priceless. Again...any families of medically fragile or special needs kiddos really need to check into the littlest heroes project. They have photographers worldwide! Reagan has had another good day today. It started off a little rough when she woke at 4am crying hysterically. I don't know if she was having a bad dream or what but after about 5min in our bed she let loose with a huge dirty/wet diaper. After cleaning her up and her mess, she settled back down and fell asleep. She woke up again around 7am and we just laid there snuggling and eventually she fell back to sleep. She slept in til 9:45am when I forced her to wake up! She had a busy day planned. Her homebound teacher came at 10am with a speech therapist. That was an interesting session. They spent the majority of the time singing to Reagan. The teacher also read to Reagan and kept mispronouncing words and the young speech therapist kept correcting her. Very funny. Then at 12:30pm Reagan had vision therapy and was triple teamed when the school OT and PT decided to accompany her. Three is definitely a crowd...poor Reagan had to be overwhelmed! I know I was! Then at 2pm her physical therapist came. That's a lot of school/therapy for one day! Hopefully she'll get a good night's sleep tonight. Reagan seems to be doing well. She's in great spirits. Lots of smiles. She was especially smiley this afternoon when she pooped all over both me and herself. It was literally dripping down her leg and off of mine! I hope I got all of it off of our carpet! Yuck! She's been a little gurgly today...sounds like it might be sinus congestion. I know my allergies have been horrible. On a good note, she has not been wiping at her nose lately. I don't know if that's because the Zyrtec is helping her or if it's just coincidental. You never know. Please continue to keep her in your prayers...we need these good days to continue! So Reagan finally woke up last night around 11pm...right as we were drifting off to sleep (I think she woke up because she had to pee...she didn't go all day while she was sleeping). I got up with her and she was in good spirits so we just sat up and watched hoarders til she got sleepy. I laid her down at 12:45am and she slept through til 8:30am. I was so glad to see her actually wake on her own this morning (instead of sleeping the entire day). She was a little groggy during the day and took a few short catnaps on my lap, but all in all she was awake most of the day today. The chorea (movements) seem to have settled down along with the nausea, so I'm hoping whatever it was that she was fighting off is gone now. She's been such a sweetie today. Very calm and cuddly. I love snuggling with that girl. Tomorrow is our first day of nursing...and good thing because we have a busy week. We met one nurse on Friday and one on Saturday. Both of them are very experienced and seem to be nice people. They'll probably split the week between the two of them (or possibly a third nurse). I guess we'll see how it goes. I'm just glad they were able to get everything set up so quickly. If we would have had to look for an another attendant on our own, it would have taken me weeks to months to find someone. I hope nursing works well for us. Reagan was still kicking and giggling last night when we put her in bed. I was afraid that she wasn't going to be able to wind down and go to sleep, but boy did she. She not only slept through the night but slept til 10:15am when we forced her to wake up! She woke happy and with much less movement. Her body finally seems calm. Almost too calm if you ask me...she fell back asleep after only being awake for 4hrs...and she's slept ever since. We did all we could to wake her but she would not budge. Thank goodness for her feeding tube because this much sleep would have already landed us in the hospital before. Seriously. But I'm still not sure why she's doing this. Maybe her body just needs some rest after all of that nonstop movement? Is she still recovering from being sick? I don't know. All I know is when this happened last week, when she slept the entire day, she did NOT wake happy. I hope it's different this time around. During the few short hours she was awake today she seemed in good spirits (albeit groggy) and the nausea seemed to have passed. That was horrible yesterday...we couldn't even pick her up without her gagging. Please keep our little sleepy girl in your prayers. Oh this girl! Last night was not the restful night we were hoping for. The Clonidine did not do the trick this time around. Reagan woke up fussing only 1hr after she fell asleep. We put her in our bed where she tossed and turned and fussed and cried. Not fun. It was a loooooong night. When she woke this morning she was all smiles and giggles...who needs sleep?!?! It always amazes me how she can continue to smile and be happy when she's still very much under the weather. Today the chorea was out of control and if that wasn't enough, she was super nauseous. Every time we picked her up she'd gag. For some reason she did much better just laying on the floor playing with her favorite toy. We tried to put her in her chair for vision therapy and she just couldn't tolerate being upright. I don't think I've seen her this nauseous since she was hospitalized. Poor girl just can't catch a break. And then tonight she was laying in bed next to my mom and she started doing something weird with her eyes. Everything was normal, she was just laying there looking at my mom and all of a sudden she opened her eyes way too wide. She did this off and on several times. Then everything was normal again and then a minute or so later she did it again (even more than before). It was like her eyes were bugging out. It looked very seizure-ish to me...but then again so do a lot of things I've seen lately. Hopefully I'm just being neurotic. Maybe it's neurological (like chorea) but not seizure related. All I know is that I don't like it. I'm sick of thinking everything I see is a seizure. 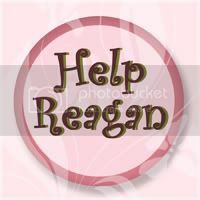 I'm sick of Reagan being sick. We definitely need some prayers in these areas. Please keep my sweet girl in your prayers. Today has been a better day, thank God. No seriously...Thank you God!!! I don't think I could have taken one more second of crying!! It seems the Clonidine did the trick last night because Reagan slept from about 9:30pm til 6am. Whew, we needed that! And even better...she woke up laughing. I was ecstatic to say the least! Today she has definitely been in better spirits. Lots of laughing (although some is the crazy kind of laughing), lots of smiling, despite the throwing up and non-stop movements she's been doing. The throwing up is back again as well as the chorea. She can't sit still. She's moving, moving, moving. The chorea has been relentless today. She kept whacking her nose continuously with that left hand, her poor little nose was bright red this morning. I have had to restrain her all day. I either have to physically hold her arm down, put some sort of weighted blanket over it, or actually put arm restraints on it to keep her from wiping at her nose. I did decided to go ahead and try giving her the Zyrtec. I wanted to wait til we got the allergy tests back, but I just couldn't live with the idea that maybe it is just allergies that need to be treated (although I seriously think it's chorea and not at all allergy related). With all of the movements she's been doing there of course have been some that look a little too seizure-ish. Making me think that a 24-hr EEG might not be such a bad idea. I don't know. I guess we'll just wait and see. I'm definitely going to keep an eye on it, but I'm praying that it's nothing. Today Reagan did have 4 dirty diapers (way out of the ordinary for her)...so I'm thinking maybe she does have some sort of stomach virus. Mike called it (he thought all along that she was having severe tummy pains). I'm just hoping that she'll get better each day and that all of these crazy movements will fade away as well. Tonight we're trying the Clonidine again, but as of 11:30pm she still seems pretty restless. Tired but restless. I was a little hesitant to give it to her again, but that little body needs some rest and hopefully this will help her get it. Lots and lots of prayers still needed for this little one! First thing this morning I called the nursing company and they are coming out tomorrow to do the paperwork and may have someone working as early as Monday. What a relief! I just hope we can find someone who will be a good fit. Thankfully my mom flew in today so at least I have some help right now. Yes, I know quite a dramatic title but oh so true. It started last night (see the previous post)...Reagan continued to cry and did not go to sleep til 2am. Then she woke at 4am and cried til 5am and then woke crying again at 6:30am. I was watching the clock...waiting for our helper to get here and take Reagan so I could get some sleep (considering I hadn't gotten any sleep the night before either). About 7:45am I get the text...she's not coming in today. I lost it. The tears were flowing (one of many times today). I really, really, really needed help today. Eventually I pulled myself together, gave Reagan her medicine and prepared her formula, and we jumped in the car to go to the doctor. We got there an hour before her pediatrician did, but thankfully they always take us straight back to a room. Good thing too because Reagan was miserable and crying nonstop! The doctor could see (and hear) Reagan's pain and prescribed her some Tylenol with codeine and yet another antibiotic. Her left ear was a little "pink" and her throat was red but with the amount of crying she's been doing that wasn't surprising. We came home and immediately filled the prescriptions but as it turns out Reagan is apparently immune to the effects of codeine. She continued to scream and cry all day long. Actually it was more of a hoarse moan/cry...every waking second! And that was pretty much the entire day because she never slept longer than 1-2 minutes at a time the whole day. 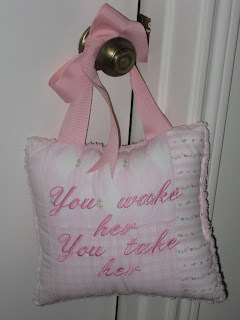 She'd doze off and then wake crying with a vengeance. Ugh. What a horrible, terrible day. And to top it all off...I get an email from our helper to say that she's quitting!!! (Don't you just love technology?) She knows that we need someone dependable and she has other things going on right now and can't be that person. OMG. I guess it's time to go the nurse route. I'm calling them tomorrow. Please keep all of this in your prayers! First and foremost Reagan's health. Whatever it is, is causing her serious pain and discomfort, so please pray that this antibiotic does the trick and has her feeling better by tomorrow (and that she gets some sleep tonight...with the help of clonidine). Also pray that we can find a dependable, good nurse to fit our needs. Lots of prayers needed. Oh what a night! Reagan started up with the erratic behavior right before bedtime. We didn't even put her down til midnight but she was wide awake and moving nonstop. She was crazy with that left hand, hitting/wiping at her face continuously. I tried putting her weighted blanket over her arm to hold it down...she was not having that! She'd start fussing, then crying, I'd pick her up and soothe her. But she was NOT going to lay there in that bed! At 3am I was desperate and even tried the "cry it out" method. That didn't work either. I could only take so long of listening to her scream. Then we put her in bed with us. She wasn't really thrilled about that either. She was very fussy and restless. I don't think she finally settled down til around 6am. Then she slept. She was still out like a light at 10am when her teacher showed up. We tried our best to wake her, but she was limp. We even put her AFOs on her for an hour and she slept straight through it. What are we going to do with this girl??? No really...what?!?!? I definitely think it's all chorea related. Maybe we should add back her nighttime dose of Risperidone? Although I'm still skeptical if it's helped her in the least. But seriously...we're desperate for some sleep tonight. Maybe we should try the Clonidine again at a higher dose? I have NO clue what to do but if we don't get some sleep we're all going to go insane! Unfortunately based on the events of this afternoon I don't think sleep is going to happen tonight. Reagan slept nonstop until about 5:15pm. About an hour or two before she woke up she started crying out in her sleep. She was doing it often and each time she'd take a huge breath in and scream and then her body would go completely limp again. It was very strange and it definitely concerned me. And when she woke up...the crying continued. She was on edge for a while and then the full out screaming crying started. Poor Mike was watching her while I went with our Bible study group up to the Ronald McDonald House up at Texas Children's to serve dinner. He was a sport though and somehow managed to cope until I got home to relieve him. I could have never imagined what I would come home to. Reagan was beyond tense. Her whole body was trembling and restless and she kept crying her breath away to the point where she'd gag herself. It was horrible. She was sweaty and red and just full out hysterical. Something is not right...not right at all. She certainly seems to be in pain. It's midnight right now and I think I'm in for a very very long night! Please say lots of prayers for Reagan! Here is the video I've been promising. Sorry this was a 10 min video and I couldn't figure out which clip was best. This is from Sunday (pause the blog music to hear her). While I was attempting to edit it yesterday, Reagan was sitting on my lap and heard the video and started saying GaGa again! So cute! Last night went about as I would have guessed. Reagan made it til 3am in her bed and then slept with us for the rest of the night. Actually she continued to sleep til 10:30am or so this morning all sprawled out in our bed. Must be nice! At least someone got a good night's sleep! She woke up with a fury, screaming and crying. I admit I was a little worried at what our day was going to hold. All turned out well though. Once she calmed down, she was great for the rest of the day! She's been very talkative again today. Reagan had feeding therapy today which went surprisingly well considering she threw up twice yesterday. And then this afternoon we picked up her new AFOs. Very cute...I just hope she tolerates them. Overall she's been less moody today. Only a few of the outbursts...mainly just talkative...in a good way (I promise to upload that video tomorrow). She did have some chorea-like movements today. I sure hope that doesn't mean she's getting sick again. Please keep her in your prayers that she pulls through whatever is bothering her and gets well!!! The back. Yes...there are little wings that hang off this shirt!! So cute!! Today has been an interesting day. 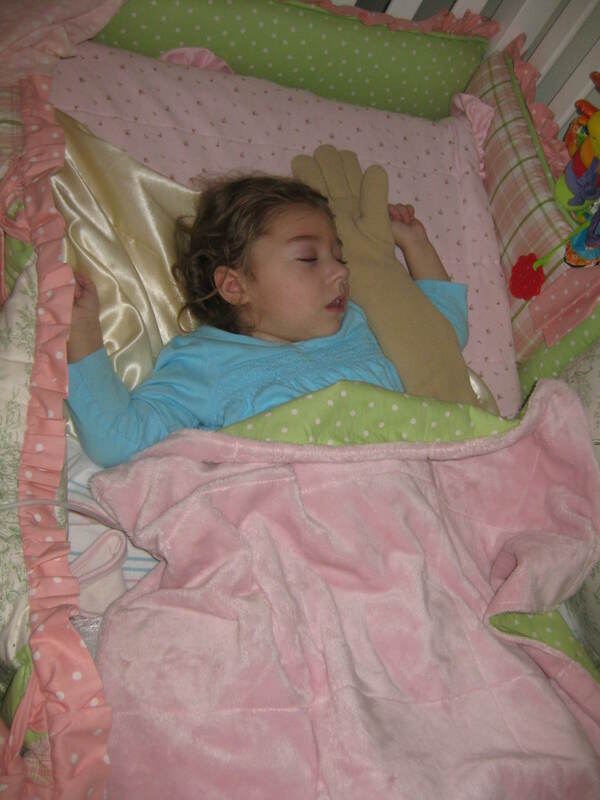 Reagan was not going to sleep in her bed last night so I put her in with us and that made for a long night. She slept well for the most part, it was Mike and I that had a rough time of it. This morning didn't start off great either, with Reagan throwing up first thing (and then again tonight). After that she seemed OK. She was exceptionally talkative all day today. Lots of sounds but especially lots and lots of GaGa's. I don't know if she realized Grandma had left or what. I did get some of it on video (I'll try to post that tomorrow). Then this afternoon the tide shifted again and her behavior became very erratic. One second she was laughing and then the next she was crying. Lots of yelling out. Sometimes she would yell out and then she'd start laughing hysterically. Very bipolar. I wonder if any of the many medications she's on could be contributing to such crazy behavior? I hate to see her like this. It's like she doesn't have a second where she can relax and be calm. I have no clue what this means for sleeping tonight. Can't possibly be good. If we could just get her happy and healthy again!! Please keep her in your prayers! Reagan slept well last night and thankfully so did we! She's been in a good mood today. She's still having those "outbursts" though. Yesterday it was mainly laughing/movements but today it's also crying/movements. I'm hoping it's just the chorea-like episodes that she was having before...and nothing at all seizure-related. Whatever it is, it's definitely neurological and I don't like it. If this continues a longer EEG may be in order. I pray it doesn't continue. On the Easter front, not much going on here. Reagan's still running low grade fevers so we're not going to even attempt church tomorrow. We have no plans whatsoever for tomorrow. My mom flew back to Denton this afternoon...she has to work on Easter...no fun! I have the cutest Easter outfit for Reagan but she has no where to wear it! Maybe I'll just put her in it to get some pictures. Hope everyone has a great Easter tomorrow! Reagan has been a handful today (but maybe that's just because I had no help today). She slept well last night and even slept in late this morning...a little too late...that should have been my first clue. I'm glad she slept in though, it gave me time to get her medicines ready and in her. When the PT showed up at 10:30am Reagan was still sleeping. She did some leg & ankle stretches with her that finally woke the little sleeping beauty. She actually seemed in a good mood. We even put her in the stander for a while with no complaints whatsoever. Then this afternoon is when the mood shifted. She was antsy and feisty. Then the crying started. Sobbing. She definitely seemed to be in pain. Then she had some serious gas and cried herself to sleep. Poor girl. Since then she's pretty much been sleeping nonstop. That's right, all afternoon! I spoke to the pediatrician's office today and they said that this is pretty typical and not to worry (and all her other tests came back fine). That she'd probably continue to have a low grade fever and be a little off for several more days til she fully gets over this virus. Ugh...I just want her healthy!!!!! Please keep my sick little one in your prayers. Today we finally got a glimpse at some of Reagan's photos taken from her Littlest Heroes photoshoot. I would highly recommend this program to anyone with medically fragile or special needs kids as they have photographers throughout the US. I had put off having professional photos taken of Reagan because of the substantial cost as well as the awkwardness of having to explain our situation to some stranger. This program paired us up with a local photographer who had generously volunteered her services because she wanted to help others and for that we are very thankful. Her name is Erin Golan and she's posted a sneak peek of Reagan's photos on her blog for everyone to see. I absolutely love some of the photos and can hardly wait to see the rest!